How does this rugged, Latvian-made DI box compare with the established competition? Latvian manufacturers Simple Way are, to me at least, a new name, although the company have apparently been in business since 2003. 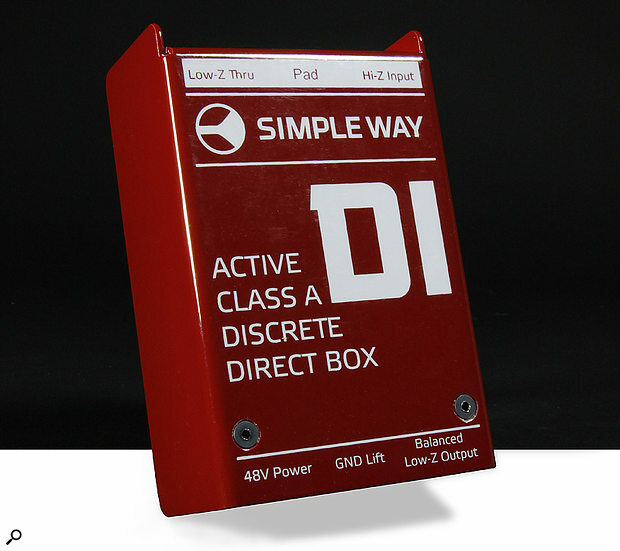 Their current product line-up comprises a range of three active DI boxes, of which the D1 is reviewed here. This is a single-channel discrete-transistor and audio-transformerless DI box. The company also offer two- and eight-channel variants, logically called the D2 and D8, with the latter being a 1U 19-inch rackmount model, but all three share the same core circuitry and features. The review unit was shipped in a sturdy cardboard box, and upon opening it I was impressed with the D1’s very rugged construction. The unit’s thick steel chassis measures 95 x 50 x 150 mm (WHD) and is painted in a dark-red colour with crisp white lettering and overhanging ‘book-end’ side cheeks to protect the switches and connectors. The overall look and feel could easily be mistaken for a Radial product, but I was disappointed to find that some lettering had rubbed off (or had not been applied correctly) around the input socket, suggesting quality control might not be as good as it should be. That initial similarity to a Radial design turns out to go deeper than the outer steel case, though, as a block schematic shown on the company’s web site suggests a very similar internal configuration to the ever-popular Radial J48 active DI box. 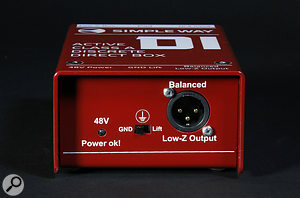 Most simple battery-powered active DI boxes employ a JFET-input buffer stage driving an audio isolating transformer, which provides both the balanced mic-level output, and separates the input and output grounds for the avoidance of ground loops. However, batteries have a habit of going flat and so many designs use phantom power from the preamp to energise the internal circuitry for more reliable and consistent operation. However, since phantom power relies on the balanced output’s grounded cable screen connection as the current return path, this approach introduces some complications when it comes to isolating the input and destination grounds to avoid ground loops. In essence, the DC-DC converter employed both in the J48, and here in the D1, uses the phantom power supply to energise a high-frequency oscillator, the output from which is passed through a small isolating transformer. 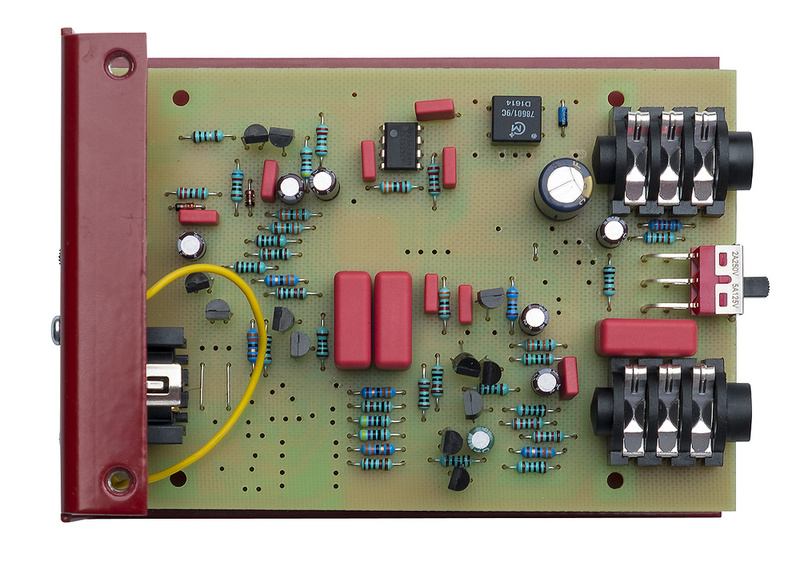 The AC output from this transformer is then rectified to create an entirely isolated and independent DC voltage that powers the DI box’s audio electronics. With this arrangement there is no requirement for a direct connection with the phantom supply ground, and so no risk of ground loops between the input/thru and balanced output connections. Like the J48, the Simple Way D1 also uses active circuitry to produce the symmetrical balanced mic-level output, completely omitting an audio transformer for better sound quality. 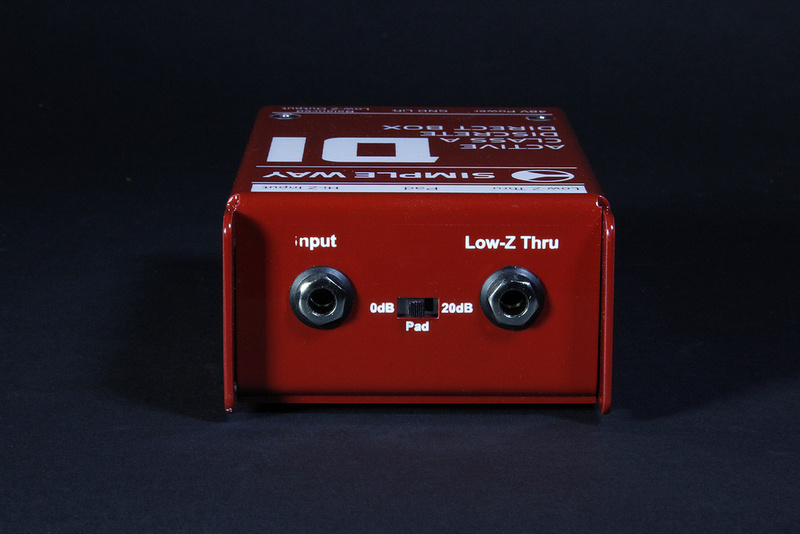 Features include a switchable 20dB pad, ground lift, and an active buffered thru output.As might be expected, the D1 is very straightforward to use, with the unbalanced input connected via a quarter-inch TRS socket (ring and sleeve contacts are both connected to ground) on one end panel. The input circuitry presents an impedance of around 4.7MΩ normally, although that falls to 47kΩ when the 20dB pad is engaged (via a slide switch next to the input socket). An unbalanced unity-gain thru output is provided alongside on a second TRS socket (ring and sleeve contacts both grounded again), and this is an electronically buffered output with a low (100Ω) output impedance, rather than a simple passive parallel link, as so many DI boxes offer. At the opposite end of the DI box is a (nominally) mic-level output XLR, with a blue LED to indicate the presence of phantom power (there is no internal battery option, so phantom power is essential for this DI box to work). An adjacent slide switch isolates the input/thru grounds from the output XLR’s pin 1 to prevent ground loops. Of course, the advantage of a buffered output for the thru connection is that the ultra-high input impedance is guaranteed regardless of what may be connected to the thru socket — with a direct link connection, the thru destination’s input impedance will tend to dominate the actual impedance seen by the instrument. However, given the decision to employ an active buffer for the thru output, and to use a TRS socket, I’m very surprised that Simple Way didn’t also take the opportunity to configure this output as an impedance-balanced connection (at the very least), since that would offer worthwhile benefits when used with balanced destinations such as a local recording system, for example. The main DI’s mic-level output is balanced and driven symmetrically by an active output stage, at a level roughly 6dB lower than the unbalanced input signal level. The published specifications state that the maximum input level is +9dBu (or +29dBu with the pad engaged), which I was able to confirm with my own bench tests. While that limit should be fine for most instrument sources, including high-output guitars, I also noted that the total harmonic distortion rises rapidly above an input level of +4dBu, climbing from 0.008 percent below that point to about 1.6 percent at +9dBu. Larger input signals result in reasonably equal clipping on the positive and negative waveform peaks at the balanced output, but the thru socket clips only on the negative half of the waveform. Checking the frequency responses of the main and thru outputs, I found both to be ruler flat far beyond the limit of my Audio Precision test system (ie. >80kHz), with -3dB points comfortably below 10Hz for both. One potential issue when DC-DC converters are employed is a risk of oscillator whistles getting into the audio signal path, but an FFT plot of the balanced output revealed nothing nasty at all, and all spurious signal components were well below -130dBu. The signal-to-noise ratio for both outputs measured better than 106dB relative to a 0dBu input signal, which is excellent. 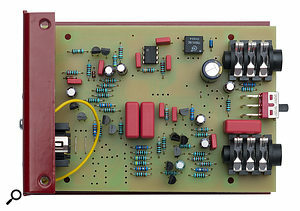 Internally, the electronics are all carried on a single-sided glass-fibre circuit board, mostly constructed using conventional through-hole components including several ‘red-brick’ Wima capacitors. The audio circuitry is entirely discrete and I counted 12 small signal transistors in total, although I don’t know how many of those are employed in the audio signal paths and how many relate to the DC-DC converter and power supply section. At least one must be a FET for the high-impedance input, and there is also a single IC within the DC-DC converter section, which I suspect forms part of the oscillator circuit. The manufacturers claim that the circuitry is “true Class-A” with “no feedback loop amplification” and uses only “solid-state transistors”. I think we can forgive some translation slip-ups given that Simple Way are a Latvian company, but for the record transistors can only be solid-state; it would be unusual to employ anything other than Class-A circuitry in a discrete transistor device like this; and while there is no amplification at all (just unity-gain buffers and some attenuation), it’s almost impossible to design a practical transistor circuit with no negative feedback at all! The D1’s circuit board.Of much more relevance, the circuit board has a lot of unused holes indicating omitted components, but there were a surprising number of both surface-mount and conventional resistors soldered directly (and not very neatly) between tracks on the underside of the PCB. This suggests that a lot of changes have been made to the design but the PCB hasn’t been updated, which reignites my earlier concerns about quality control. In general use the D1 performed extremely well, and compared very favourably indeed to my current go-to active DI boxes from Orchid Electronics, which have a similarly high input impedance (over 1MΩ). In fact I couldn’t reliably tell any difference between the D1 and an Orchid Micro DI from their sound quality or character at all. Naturally, I also compared the D1 against a Radial J48 and while both gave perfectly usable results I found I could often detect which was which — mainly because of small tonal differences affecting transients. However, I think this is to be expected given the much lower input impedance of the J48 (at 220kΩ), and I’m not sure that such subtle differences would make either DI box preferable over the other in every situation. I did occasionally come across minor problems with sources generating elevated signal levels, particularly when using the DI box with high-output keyboards and other line sources. The D1 doesn’t really like signals much greater than about +5dBu without the pad, but switching the pad in reduces the input impedance dramatically, changing the tone of guitars and basses quite substantially. 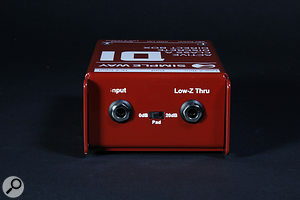 So, when used with guitars featuring very hot pickups, or with aggressive slapping techniques on the bass, for example, there was often noticeable peak distortion, and while that was sometimes deemed to add useful ‘attitude’ it also sounded unpleasantly gritty on sustained sounds such as those from my Hammond XK-1C keyboard, for example. In contrast, my Orchid DIs remained completely clean at even greater levels (up to around 16dBu) and simply delivered the source sound without fuss. It’s also worth noting that the Radial J48 behaved in a similar way to the D1, introducing some audible distortion for signals above about +4dBu. Something else worth noting is the very different behaviour near clipping for the D1’s thru and main outputs. The former clips heavily on the negative half of the waveform only, and the resulting distortion is very obvious and unpleasant, while the balanced XLR output clips symmetrically and much less dramatically at the same level. This means that if the thru output is being fed to a local amplifier, the musician will probably become aware of impending disaster before the recording or PA output is badly affected, which could be a useful feature! In conclusion, I found the Simple Way D1 to be a very competent active DI box. Some aspects of its design have clearly been inspired by Radial’s J48, and it is a credit to Simple Way that the D1’s performance matches or exceeds that of the J48 in most areas. That should help to justify the D1’s relatively high price, which is only slightly less than the street price of the well-proven and highly regarded Radial product. However, I do have some reservations about the circuit board modifications, given the price, and it must also be said that the competition is fierce, with a great many alternative active DI boxes on the market. The most obvious direct competition is the Radial J48, which appears to have inspired the design of the D1, but the J48 does offer several additional features and facilities. 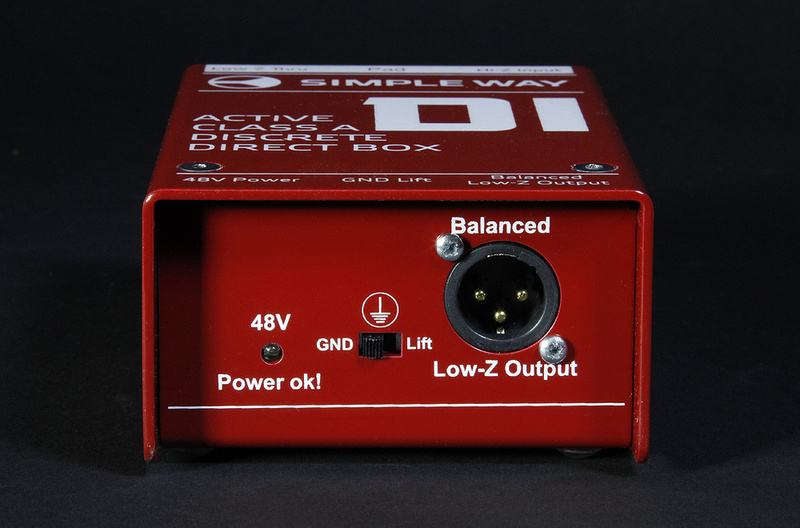 Other well-proven and high-quality active DI boxes include the Klark Teknik DN100 and DN200 and the BSS AR133. However, my current go-to active DI boxes are the stunningly good Orchid Electronics Micro, Classic and Muting variants, all of which cost significantly less than the D1, and comfortably outperform it. 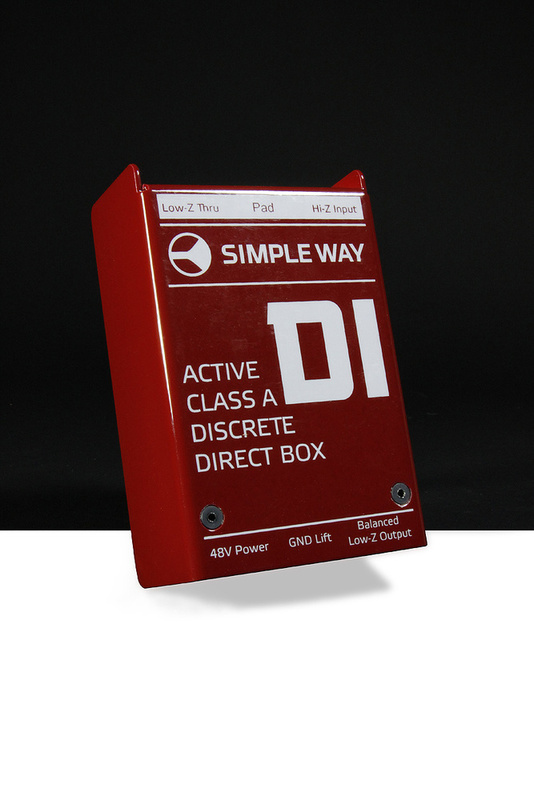 A very rugged active DI box with a good technical performance and discrete Class-A electronics from a small Latvian manufacturer.